This article is by Taylor Proffit, and originally posted at NuMundo.org and reprinted/recorded as a podcast with permission. Back in October, my friend showed me The Permaculture Podcast for the first time while we were camping, developing business models and visioning the future of each other’s work in the startup world of San Francisco. It was an appropriate time to listen to the episode where Ethan Roland of Appleseed Permaculture spoke about the Eight Forms of Capital in Regenerative Enterprise. Having listened to nearly every episode from the last 5 years in a matter of weeks, I’ve been deeply moved and inspired by this daily dose of educational therapy that has pushed me to make meaningful changes at a crossroads in my life. This is one of the most transformative collections of media I’ve come across to date. I’ve included links to the shows on the website, but you can download the mobile app as well. If you feel so inspired, support the growth of the show with a one time or monthly donation on Scott’s crowdfunding platform or leave a review on the itunes app store. 1. Ethan Hughes and Necessary Simplicity & Practical Possibilities with Ethan Hughes – Ethan Hughes is a permaculture practitioner and radical minimalist that founded the Possibility Alliance, an 80-acre petrol and electricity-free homestead that gifts over 1,500 permaculture design courses each year. After traveling the world and watching the innumerable tragedies that fossil fuels and Western civilization have imposed on the earth, indigenous populations, and the minds of the masses, Ethan decided to give up his car for a bike, eat dinner by candlelight, liquidate his financial capital, and begin educating people about changing harmful lifestyles. I cannot explain how game-changing it was to hear Ethan tell his story: 20 years of slowing down to the simple life where chocolate doesn’t belong, where in the last ten years his car has only been used twelve times for emergencies, and where the inner landscape work to make these external changes is of utmost importance and is the only practical path. Here is another article with Ethan over at Mother Earth News. 2. Edible Forest Gardens and permaculture with Dave Jacke – Dave Jacke is a permaculture practitioner and co-author of Edible Forest Gardens that tells it like it is. Like Ethan Hughes, Dave asserts the importance of inner landscape work if any external actions are to have lasting results. His work with perennial food forestry is comprehensive, and the content of this conversation has given me a more clear understanding of how to move forward in my path, both internally and in the outer landscape, specifically with regards to food forestry. 3. Right Livelihood with Ben Weiss, Dave Jacke, and Charles Eisenstein– This recent episode features permaculture practitioners Ben Weiss and Dave Jacke, and author of bestseller Sacred Economics, Charles Eisenstein. The conversation traverses the ways in which we can integrate the lessons of the old story, and begin to make positive changes toward the new world we wish to inhabit. A true necessity for the contemporary changemaker. Linked in the show notes is the second half of the conversation without Charles (who had to leave the discussion early). Reprinted with permission from The Permaculture Podcast. Ben Weiss, Dave Jacke, and Charles Eisenstein panel discussion (left to right). 4. Restoration Agriculture with Mark Shepard (Parts 1-3)– Mark Shepard is a practical go out and get it farmer. He’s not interested in obscure uses of the word permaculture or anything short of prolific results. 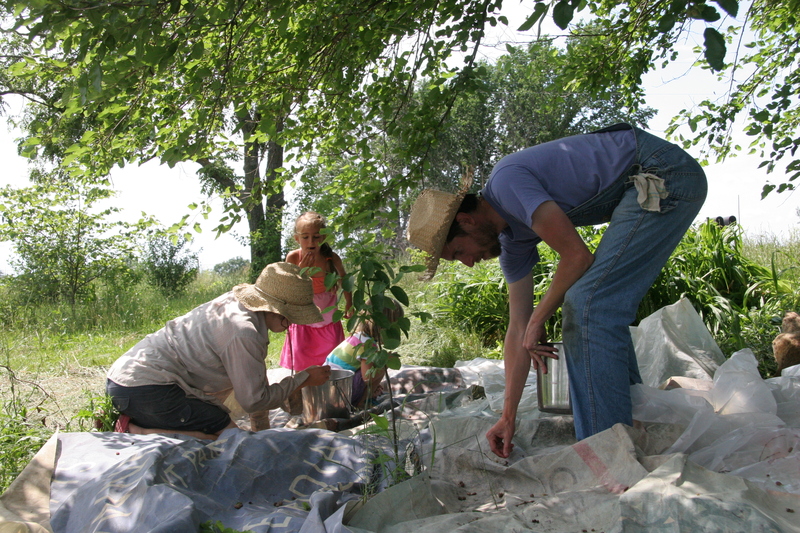 This three part discussion explains Mark’s story and experience with the Organic Valley Co-operative farmers group, in which biofuel tractor design, perennial food forest design, and efficient chestnut growing are all shared practices to build a resilient network of farmers who live in the same proximity. After listening to the first episode, I was thrilled to see there were two more to listen to. This is a great episode for practical solutions to profitable farming, truly restorative land management practices, and integrative food forestry design. Whole Systems Design, LLC Firm Overview from Ben Falk on Vimeo. A visual overview of some of the work Whole Systems Design performs in Vermont, New England and abroad. Enjoy and check us out at www.wholesystemsdesign.com for more information. 6. Eight Forms of Capital and Regenerative Enterprise with Ethan Roland– If you haven’t read Regenerative Enterprise by Gaia University Graduates Ethan Roland and Gregory Landua, I encourage you to do so after this episode. This show outlines the conceptual viewpoint of the eight forms of capital, of which financial is only one. I’ll let Ethan explain how this simple formula for viewing the world makes all of your work, whether it is volunteer work at a food bank, growing your own food, traveling, or reading books, as contributing to your wealth as a human being. Reprinted with permission from The Permaculture Podcast. The Eight Forms of Capital infograph. 7. Responsible Business, Responsible Entrepreneur with Carol Sanford– Fast on the heels of the Eight Forms of Capital episode, Carol Sanford takes the concepts of Regenerative Entrepreneurship to new heights with responsible entrepreneurship being her twist on the subject. She speaks about ethics-driven corporations and right relations business practices that make for truly regenerative business ventures. 8. Natural Building and ThePOOSH.org with Eric Puro– It was a pleasant surprise to hear my friend and new world colleague speak about how natural building changed his life and how, by searching craigslist for free land and buying a couple books, he and his friends built their first earth ship from all natural and up-cycled materials. Eric speaks about an ecovillage tour of Europe, starting a web platform, natural building with no power tools, and meeting people where they’re at in any type of work that cares for the earth, community, and oneself. Visit ThePOOSH.org to start or join a natural building project today. 9. Economic and Financial Collapse with Nicole Foss– This talk with Nicole Foss, founder of Automatic Earth, on building community resiliency at a time where growth is coming to its limits, has inspired me to take my commitments of local action further. In a society where infinite growth is assumed possible, and even necessary, this exhaustively researched and academically referenced talk about Economic Collapse asks the listener to think about how they would live if energy and fossil fuels ran out today. Would you live? What necessities of life would you have secured from within your home or bioregion. Which neighbors do you know enough to collaborate with to stay healthy? Would you have any food or water if exports stopped immediately? I’ve been thinking a lot about this topic lately, and relocalization of my physical needs to survive has become a relatively high priority. By making deep relationships with local farms, finding a local spring, and planting fruit trees today, we can buffer the effects of economic collapse by building a thriving community where we live. 10. Urban Permaculture in Baltimore, Maryland – The final episode I’ve chosen goes deep. It begins with the stories and backgrounds of Eric and Victoria, the founders of Charm City Farms. While Eric’s background story is brief, Victoria’s is as authentic and genuine as it is lengthy. She speaks about her path as a visual artist and student, growing up in Georgia and being completely enthralled with nature, and reading depth psychology authors such as Carl Jung and Joseph Campbell to help her make sense of her life. She also gives history on her herbalism and permaculture studies. Victoria gives the listener a relatable and cherishable story of her struggles, her darkness, her challenges, and tells the story of her life’s transformation through permaculture and urban community development. After listening to the work of Eric and Victoria just a couple days ago, I’ve been inspired to make changes in my place, as they have, and decided not move to the big progressive cities where movements are already so large and prominent (like Boulder, Brooklyn, Austin, Portland, etc). Eric and Victoria grew the first public urban food forest in Baltimore (and they are already starting to plan their second). They do primitive skills workshops in the middle of the city, and they do the inner work that is so essential to truly help people in underprivileged communities. This inner work is particularly essential in order that change agents may be in right relations, or as Victoria says, “do right by” the community they serve. It is easy to want to go to places where the large movements are already happening to do this work, but if everyone does this, the rest of our country will remain stuck in the old story, and underserved communities in the places people have left behind will stay this behind. I’m not saying that we shouldn’t travel, learn new skills, meet new people, and gain new perspectives, but when it comes to setting roots in the ground, consider a place that truly needs changemakers, as Eric and Victoria did with Baltimore. Reprinted with permission from The Permaculture Podcast. Urban Food Forest in Baltimore, Maryland. These are the conversations that give educational and experiential capital far beyond return for the financial capital of supporting the podcast if it is truly in your means. I supported the show recently, and I will say that for as much educational and experiential capital that Scott Mann is giving away each week (for only the $261 that he is getting on his crowdfunding platform per month) it is clear that he truly is doing really great work for the world, for community, and within himself. You can also help spread the wisdom and education of permaculture by sharing this article or www.thepermaculturepodcast.com with your friends. What are your 10 favorite episodes of the show? What inspiration or knowledge did you gain from them? I’d love to hear from you.